So, guess what? The community asked for it, and the designers at Jagex responded. Training your Firemaking skill by making fires in long strips all across the landscape is now once again a viable training method. Compared to the hugely AFK’able update that was Bonfires. This is what everybody wanted. To light the entire map on fire. Fire that, for the most part, is entirely safe to walk upon. It does not affect its surroundings, nor does it damage enemies. It’s simply there to cook your food if there isn’t a range nearby. Of course, there’s more to it than that. There’s this whole thing with a pitch can that makes it faster and funner, Char’s minigame got a heck of an update, and even bonfires got an upgrade as well. It’s just an all-around Firemaking buff. You wanna read about it, read it here. But I want to take a step back from all this hype and instead help everyone understand… well, why IS there hype? Why are there people who prefer Line Firemaking? … heck, why IS Line Firemaking a thing in the first place? What’s the story? Well, to simplify, in order to light a fire, you use a tinderbox on some logs. Your character will animate a bit, and then a fire is made. To assist in the animation, your character is automatically moved one space to the west. Because, you know, it would just look ridiculous if they lit a fire and just proceeded to stand in it. Since this was the only way to get Firemaking experience, players found sections of the Runescape world that were these big long straight lines so they could more-or-less automate that process. Rather than moving themselves around repeatedly, they simply lit the fire, let the character walk on their own, and light another. And so on. It’s not a fad, it’s a system born purely out of efficiency. Let me take you guys back in time. A way ways back. Before the days of moss giants and lesser demons (yeah, a WAY ways back), we didn’t have much to fight. That being the case, our skills were not that high. Our hitpoints wandered the range of level 10-20. Naturally, with weak stats and armor, we needed food to keep fighting. Fortunately, items like raw chicken, beef, and rat was always a viable food source because of how easy it was to get. There were plenty of chickens, cows, and rats wandering around, and collecting their meat was mandatory for us to continue our training our combat. And training our cooking skill. This is before we even had Fishing as a skill, folks. Apple Pie was a prestige food back then, and not burning every second and third meat was a dream on its own. Yeah, the demand for food was very high. Like Cooking, Firemaking is also one of Runescape’s oldest skills. We used to only have one type of tree. Cut the tree, one type of log. Light the log, we got a fire. What do we do with the fire? Cook chicken, or beef, or rat. That was it. Lighting a fire was a convenience. One that helped supply us with the food and experience we needed to get better. Like Cooking, first time Firemakers will notice that at a low level, sometimes it takes a while to light a fire. When it takes a while to light the fire, suddenly the convenience isn’t as convenient. There were players out there who would actually hire good Firemakers to follow them around and light fires on demand so they could drastically improve their cooking. It became a collaborative effort. Back in the days of really old Runescape Classic, we didn’t have banks to stockpile thousands of logs to withdraw. What had happened was we usually had to chop down the trees ourselves, and them immediately light them. 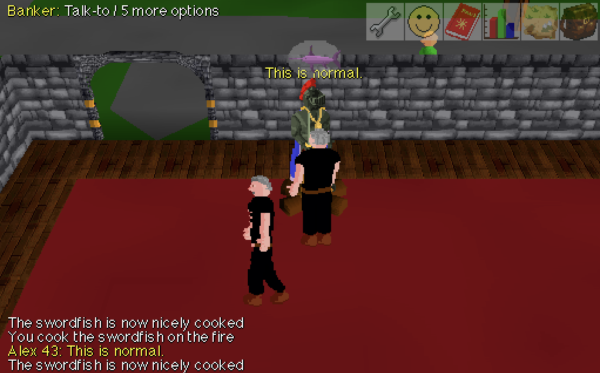 That was the best way to get Firemaking experience. In my own early years, I remember I would spend hours up in Lumbridge castle tower lighting up the log spawns up there. They spawned each minute, allowing me to light them, then pick up a round, then light the next. And so on. Once my inventory was full, I’d just light them up around the rest of the tower while waiting for them to spawn. This got me to a nice high Firemaking level, and I could light fires first try every time. Prestige. 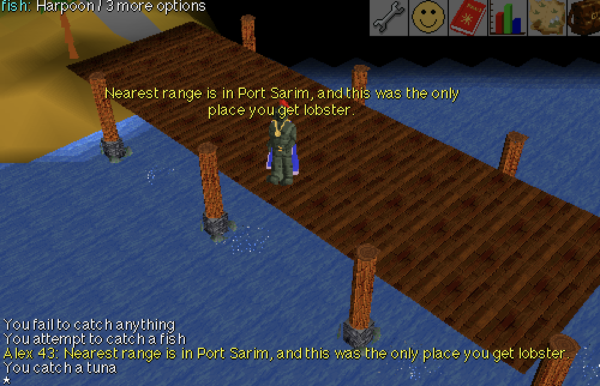 When Fishing came out, and there was a huge demand for Firemakers on the ports of Karamja (there weren’t any trees with wood there), Firemaking as a skill actually became profitable for a while. Alright, so what am I getting at with this story? In a nutshell, even back then there was a legitimate need to train Firemaking. So naturally, players would not only train their skills, but try other things to improve how they trained their skills. They balanced three aspects: Speed; how fast the experience comes in, Ease; how much effort and focus it takes, and Accessibility; how readily players are able to actually apply this method of training. Speed was simple. There was only one way to train Firemaking; lighting logs on fire. So, naturally, this was the fastest way to train it. Ease was a little more interesting. Back in Runescape Classic, Firemaking had a different behaviour. You had to physically drop the logs from your inventory, then click the tinderbox, then click the logs on the ground. Once the fire was lit, that was it; your character was left standing in the fire. To optimize this training method, players would walk around while repeatedly dropping logs in their wake, then walk back the log trail and use the tinderbox on them one by one. I actually remember there used to be troll players who would actually sabotage players trying to train like this by either lighting their logs for them, or even better, picking the logs up themselves. There wasn’t much of an item spawn delay back then. 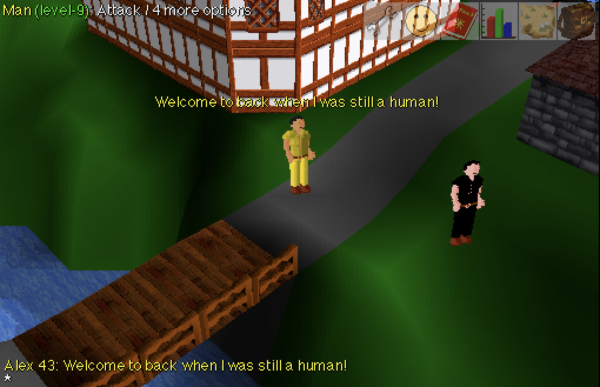 When Runescape 2 (now called Old School) came out, the Firemaking animation changed. Players made an animation for a moment, stepped one space to the west (actually, I think it used to be north at one point), and they lit a fire. If they stepped west in the right spot, then they were already in a spot to light another fire, which saved them having to manually move to the next spot. This mind-blowing breakthrough made people realize; if we could find a very long line of empty squares going to the west, it would be the ideal Firemaking training method. 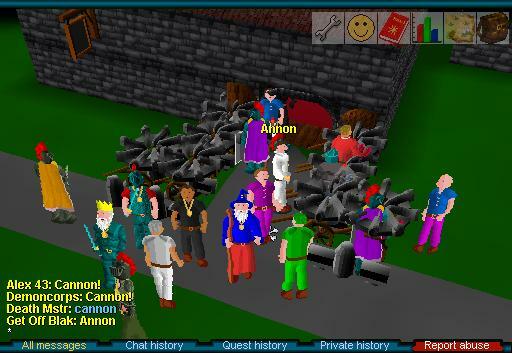 This method carried onto Runescape 3, and was later joined by the bonfire method to help promote AFK training. Because that’s what we want; to have to play the game less to play the game. As for Accessibility, the best place to have these west-facing strips was within a bountiful forest so players could chop more logs. Or nearby a bank, when that became a thing. Actually, in Runescape Classic, a lot of the banks were actually really big, open, empty spaces for exactly that reason. Gave players a lot of room to train Firemaking. So, you got to see a lot of burning banks back in the day. … which, in retrospect, was a lot better than what I used to do to them. So what’s the appeal of line Firemaking? Runescape 2 nostalgia, nothing more. It was the way to train Firemaking back in the days after Runescape Classic, which had its own variation of line Firemaking. If you’ve gotten good with training via bonfire, I recommend you continue to do so. Alex’s Analysis – Prifddinas is Awesome!